My foray into 3D texturing started on an unusual project -- a realistic, naked Jesus for Robert Waters: a Canadian artist who uses unconventional media to explore controversial religious themes. Taparrabo is on view in Mexico through January 2010. Phil Bonner modified the model while I painted out tan lines and added bloody wounds. The artist also requested that his Jesus be extremely hairy. I put some custom brushes and photo textures to good use managing the long flowing locks on his head, the shorter hair covering most of his body, and even shorter hair in some *ahem* delicate parts. 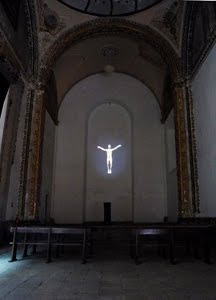 The final product was projected in a church, spinning in three dimensions. Click here for an article describing his work.